The knee joint provides flexion to the legs and absorbs some of the force of running and walking. Joints hold the skeleton together and support movement. 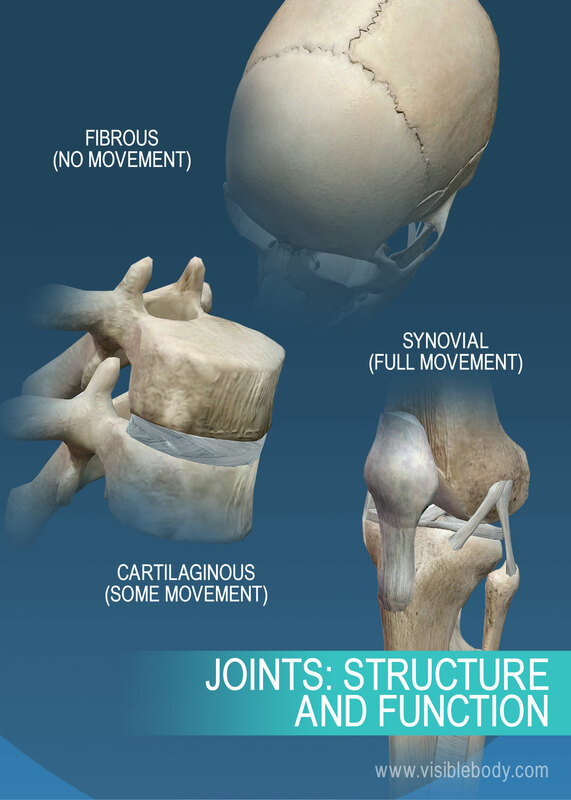 There are two ways to categorize joints. The first is by joint function, also referred to as range of motion. The second way to categorize joints is by the material that holds the bones of the joints together; that is an organization of joints by structure. 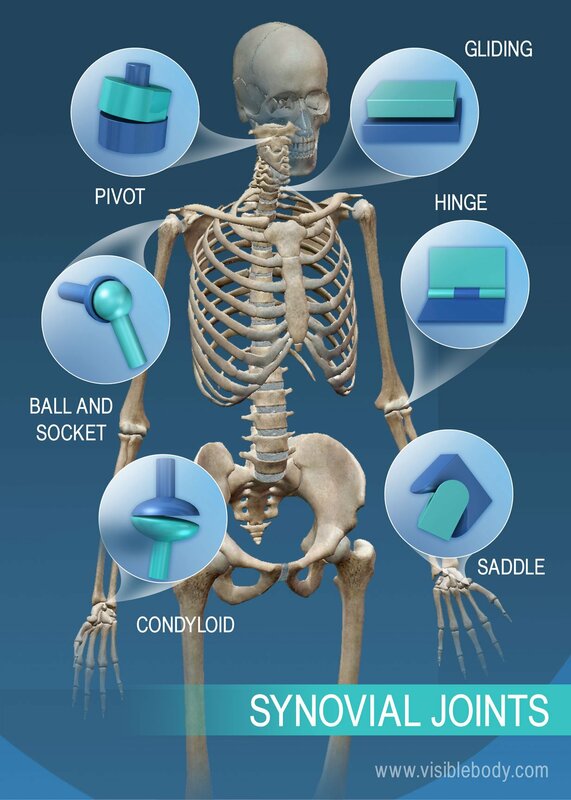 Joints in the human skeleton can be grouped by function (range of motion) and by structure (material). Here are some joints and their categorizations. 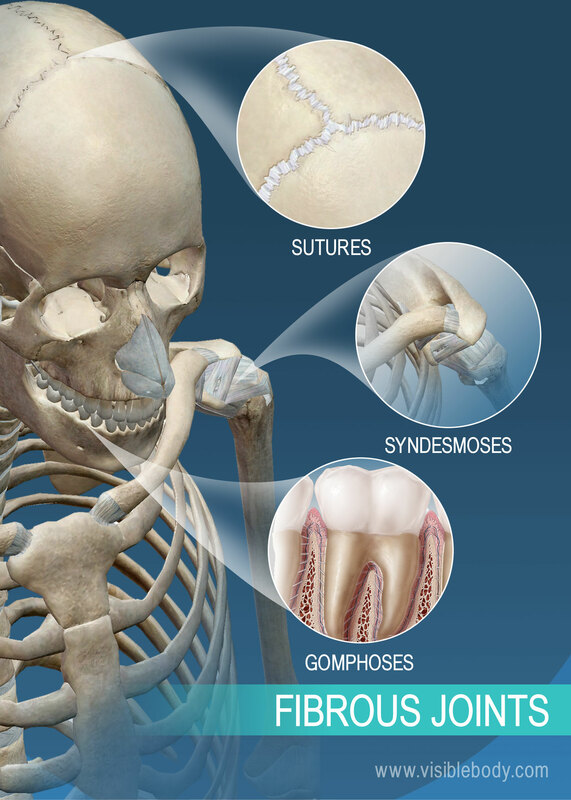 Immovable joints (called synarthroses) include skull sutures, the articulations between the teeth and the mandible, and the joint found between the first pair of ribs and the sternum. Examples of joints allowing slight movement (called amphiarthroses) include the distal joint between the tibia and the fibula and the pubic symphisis of the pelvic girdle. 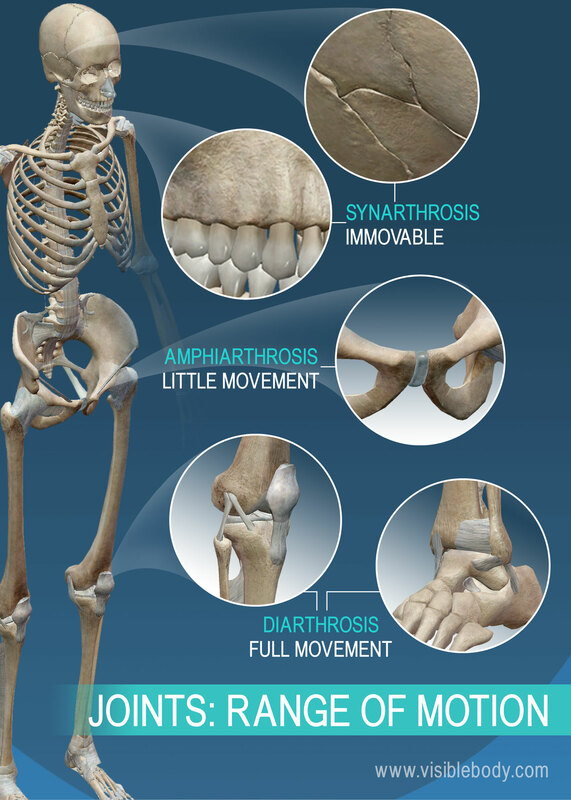 Joints allowing full movement (called diarthroses) include many bone articulations in the upper and lower limbs. Examples of these include the elbow, shoulder, and ankle. (1) Sutures are nonmoving joints that connect bones of the skull. These joints have serrated edges that lock together with fibers of connective tissue. (2) The fibrous articulations between the teeth and the mandible or maxilla are called gomphoses and are also immovable. (3) A syndesmosis is a joint in which a ligament connects two bones, allowing for a little movement (amphiarthroses). The distal joint between the tibia and fibula is an example of a syndesmosis. 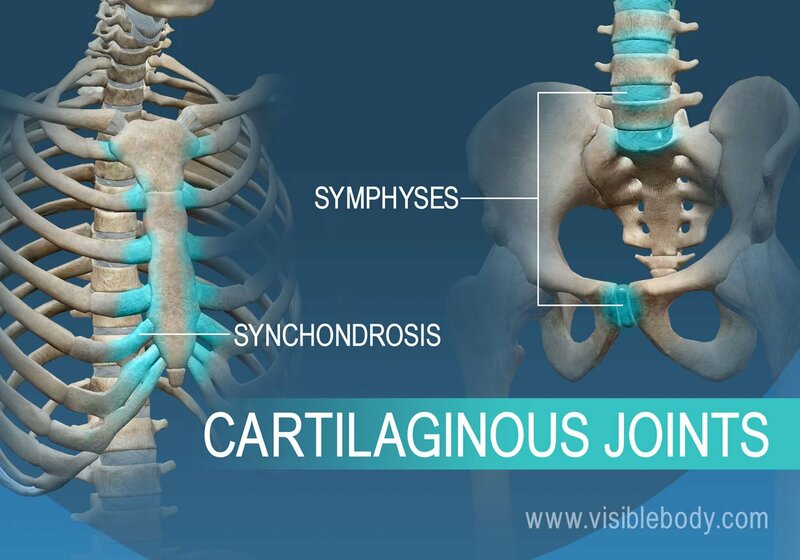 (1) A synchrondosis is an immovable cartilaginous joint. One example is the joint between the first pair of ribs and the sternum. (2) A symphysis consists of a compressable fibrocartilaginous pad that connects two bones. This type of joint allows for some movement. The hip bones, connected by the pubic symphysis, and the vertebrae, connected by intervertebral discs, are two examples of symphyses. (1) Gliding joints move against each other on a single plane. Major gliding joints include the intervertebral joints and the bones of the wrists and ankles. (2) Hinge joints move on just one axis. These joints allow for flexion and extension. Major hinge joints include the elbow and finger joints. (3) A pivot joint provides rotation. At the top of the spine, the atlas and axis form a pivot joint that allows for rotation of the head. (4) A condyloid joint allows for circular motion, flexion, and extension. The wrist joint between the radius and the carpal bones is an example of a condyloid joint. (5) A saddle joint allows for flexion, extension, and other movements, but no rotation. In the hand, the thumb’s saddle joint (between the first metacarpal and the trapezium) lets the thumb cross over the palm, making it opposable. (6) The ball-and-socket joint is a freely moving joint that can rotate on any axis. The hip and shoulder joints are examples of ball and socket joints. Information on joint replacement from the American Academy of Orthopaedic Surgeons. A table from the University of Arkansas for Medical Sciences that lists all joints in the human body.